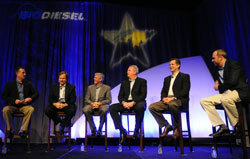 If you’re wanting to know where biodiesel will sit at the oil company table then you’re in luck because we had a morning panel discussion that included experts in the field to talk about it. The RFS-2 will likely mean that these companies will be adding biofuels to their product lines which has the potential to double biodiesel production in a single year. You’ll hear this talked about in the discussion. The moderator for the discussion was Ron Marr, Minnesota Soybean Processors and presenters included David Blatnik, Marathon Petroleum Company, LLC; John Cusick, Morgan Stanley Capital Group, Inc.; Bruce Heine, Magellan Midstream Partners; Jim Lelio, Kinder Morgan Pipeline Group; Mike Reed, Northville Product Services.